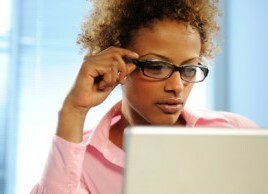 Bedford Eye Care News: Is your computer damaging your eyes? More and more women are reporting problems with their vision—and their computers are to blame. Moira Saganski's computer gives her a headache every day—and it's not from the amount of e-mails in her inbox. The 54-year-old chief financial officer from Toronto suffers from computer vision syndrome, a condition that's becoming increasingly common among middle-aged women who spend a lot of time looking at computer screens. "Computer vision syndrome [C.V.S.] describes eye and vision symptoms that are associated with digital screens, including computers, Blackberrys and televisions," says Dr. Mira Acs, an optometrist based in Toronto. "We're seeing a higher volume of baby boomers complaining of eye strains and fatigue, and C.V.S. has become more frequent over the past five years as technologies have evolved. We all stare at screens of all kinds for long periods of time." A recent study by Leger Marketing found that baby boomer women are spending more time in front of computer screens than ever before—more than four hours a day, on average—and 43 percent of them suffer from ailments related to screen-viewing. Saganski spends anywhere from six to 13 hours working on a computer every day, and it's taking a toll on her vision. "I first realized that my eyes were getting blurry and very achey," she recalls. "My vision was changing and I had a lot of headaches that were related to strain on the eye." Those are the symptoms of C.V.S., says Acs, as are light sensitivity and dry eyes. However, as these ailments are often associated with general fatigue, she says that many people don't even notice they have a problem. But left untreated, these symptoms could persist and even worsen. "Sometimes [C.V.S.] requires vision correction," says Acs. "You may need to have your glasses or contact lenses fit for how you use a computer." An optometrist may recommend computer glasses, which have a different prescription on the top part of the lenses that allows you to focus on a computer screen. You may also get a prescription for artificial tears to relieve dry eyes. Saganski says that after being diagnosed with C.V.S., she has become more aware of how her computer affects her vision, and what she can do for the uncomfortable symptoms. "Because I'm aware of it, I do try to take a break [when using a computer]. I go totally out of my office and take a walk around the work stations," she says. Saganski is certainly on the right track with her short office walks: When working on a computer, the Canadian Association of Optometrists recommends following what they call the "20-20-20 rule": Take a 20-second break from using your computer every 20 minutes and focus your eyes on something at least 20 feet away. This gives your eyes a chance to rest and recover from strain. Be screen smart, says Acs. "Take a few minutes to adjust the brightness and contrast of your screen, and make sure it's positioned correctly—about arm's length [about 50 cm] from your eyes." The screen should also be places at 20 degrees below eye level. "The lighting in the room is also very important," says Acs. Unfortunately, not everyone has the freedom to adjust the lights in their work environment, but you can cut glare and reflections on your home computer by diffusing the light that hits the screen. This will help reduce the amount of squinting you do. Make regular appointments with your optometrist to ensure that you're wearing the appropriate corrective eyewear. You also want to make sure that what seems like C.V.S. symptoms aren't the result of another vision problem.